Dendrobates pumilio are the most interesting and exciting animals I have worked with in my time breeding frogs. In the fall of 99 I obtained my first D. pumilio, and I was quickly hooked. In my typical jump in on the deep end fashion, I quickly acquired as many of these beautiful frogs as I could, and devoted a lot of time and space to housing them in a fashion which I hoped would lead to success. 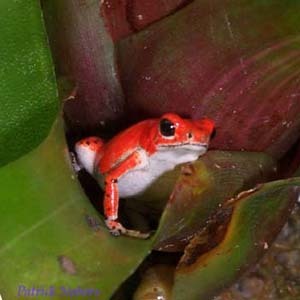 I had talked to people who had successfully bred these frogs in small numbers, and along with some reading I had done, I thought they might be bred in some numbers. 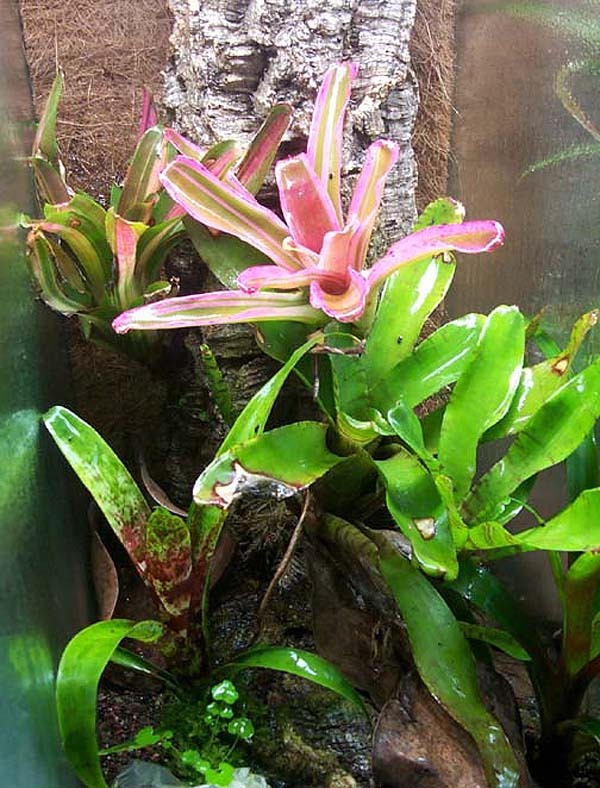 My first pumilio were set up in tall ten gallons which I built myself. I liked the setup, but felt I could improve on it. 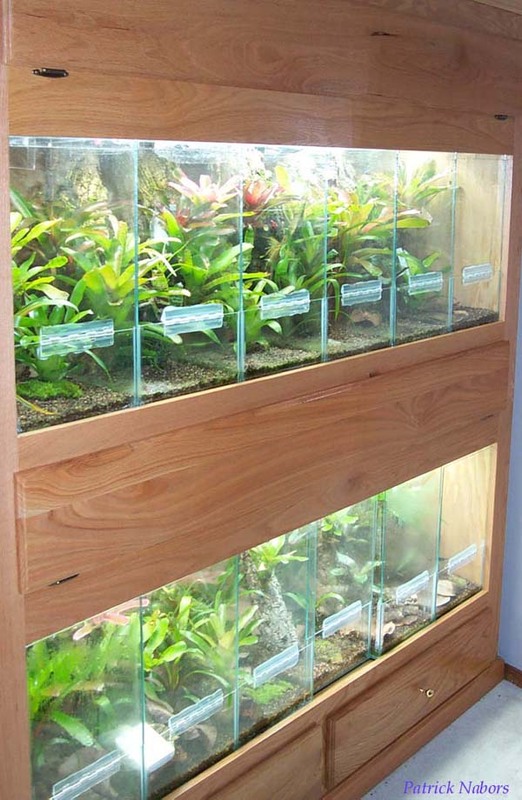 I also was running out of places to put tanks in my basement, so I thought if I made the frog tanks nice, then maybe my wife wouldn't mind too much if I put them in the house! She is pretty patient! 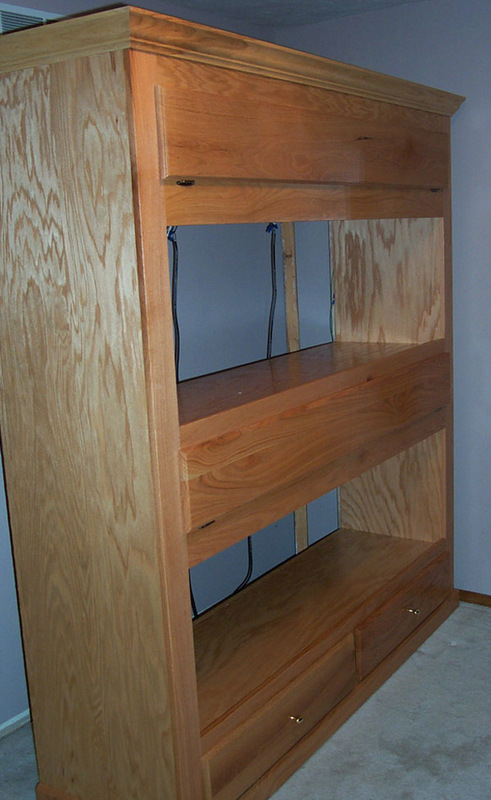 I had a cabinet maker put this together for me, and out fitted it with compact fluorescent lights, a misting system, fans etc…. This rack has now been set up for a little over a year, and I have caught about a hundred and fifty little baby D. pumilio in these tanks by now. 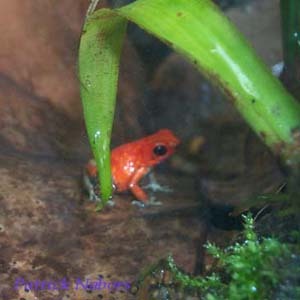 It is like a little treasure hunt, looking for the tiny red frogs in the tanks. 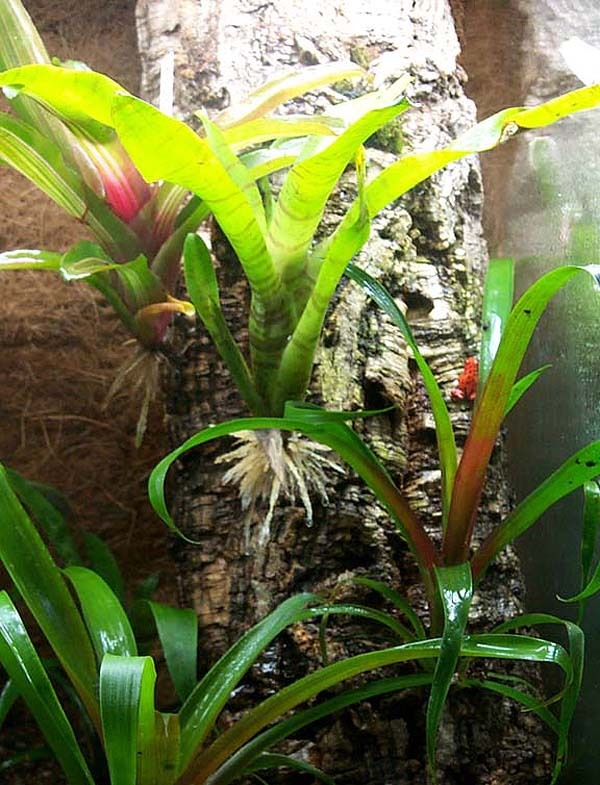 The bromeliads and moss have thrived under the high intensity light, and these frogs seem to almost bask in the bright light. A few of the details are covered here….the unit is about six feet long, and six feet high. The wood is oak plywood and solid oak. 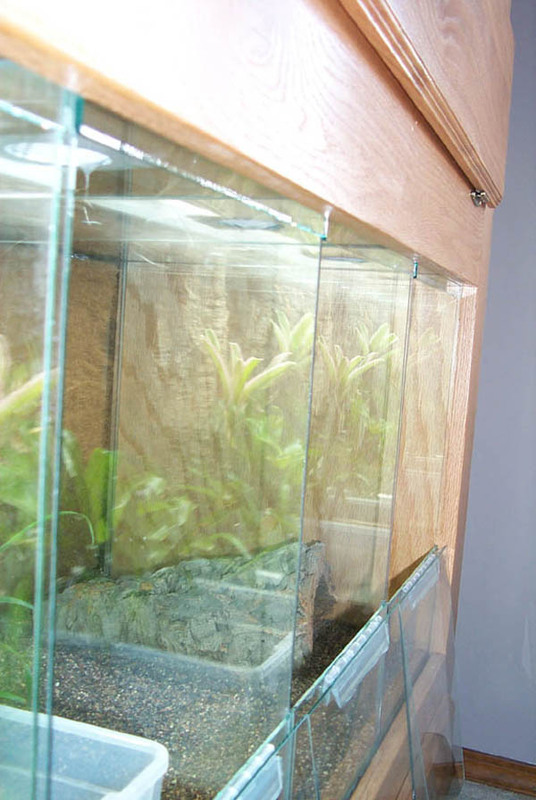 It is fitted with four 96 watt compact fluorescent bulbs, 6500K, from Aquarium Home Supply, at Ahsupply.com. I can't tell you how nice these lights are, and this company offers kits which are perfect for this sort of custom installation. The tanks are misted by the Ecologic Technoligies Rainmaker misting system, and are drilled for drains, which run along the back edge of the unit. 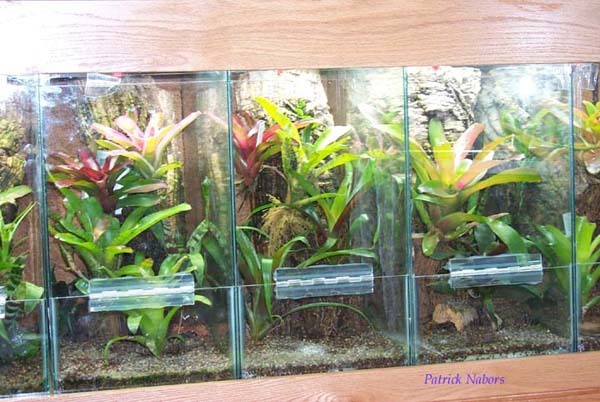 The misting system is an important part of breeding pumilio, in my opinion. I also have a hole in the back and top panel, for a fan system, which is mounted to the back of the tanks. The fans are operated by a timer, and come on for a little while every couple of hours. The fans are fitted with rheostats to turn the speed up or down. I run them at the lowest flow. 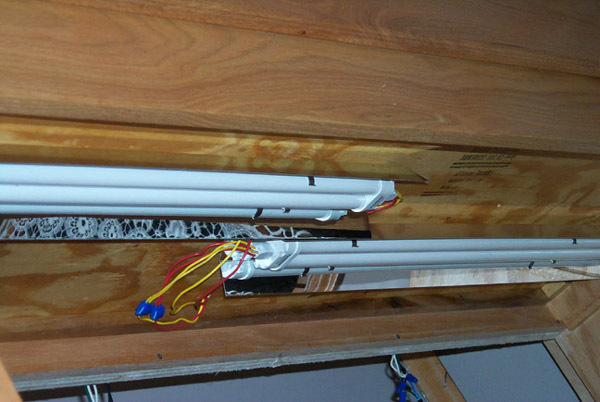 The fan system was provided by Dave Lawson, david@justservice.com , and has worked great. Well any way, enjoy the pics!